It is rarely a good idea to put hot pans directly on your countertop. Even though a manufacturer may claim a countertop is totally heatproof, this is often untrue. Extreme heat can cause everything from minor, easily fixed surface burns to virtually irreparable cracks or melting. Here is a quick guide to dealing with heat damage for various countertop materials. 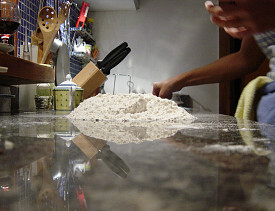 Plastic Laminates: To remove a minor, light-colored burn from laminate countertops, coat the spot with a baking soda paste for about 30 minutes and wipe off. Laminate surfaces with deeper burns typically need to be replaced, but it may be possible to replace the surface of just one section. Wood: Sand away burn marks on butcher block or other wood countertops with 120-grit sandpaper, then go over the area again with finer 180-grit sandpaper. Add a wood filler if needed. Finish with a rub of 4 parts mineral oil to 1 part melted paraffin wax, to protect the wood. Varnished or painted wood surfaces will first need to be stripped with a food-safe chemical stripper. After sanding away the burn, replace the varnish or paint. Solid Surface: Heat damages Corian and other solid-surface countertops fairly easily. However, the damage can be reversed equally easily by sanding around the burned spot. Cover the tracks of your sanding with Bon Ami or other abrasive cleaner. Serious burns may require an electric sander. In either case, wet the surface to minimize dust. Severe heat can crack the countertop, which will probably require you to hire a professional for repair. Stone: Many natural or engineered stone countertops are virtually heatproof. However, some stone surfaces are liable to crack if exposed to extreme temperatures. Again, these are best repaired by a professional, but some stone epoxies are available for repairing small cracks. Concrete: Extreme heat can also crack or burn concrete countertops, though penetrating sealers can help prevent such damage. Use a tinted two-part stone-grade epoxy to repair hairline cracks in concrete. Consult a professional for larger damage. Tile: Most ceramic and natural stone tiles are virtually heatproof. However, if an individual tile cracks or burns, you can replace it yourself. Basic instructions for tile repair: Use a grout saw to remove the grout all the way around the tile. Tap the tile with a chisel until it breaks apart. Then use the chisel to remove all the tile pieces, as well as any remaining grout or adhesive. Apply adhesive to the back of the replacement tile and press firmly and evenly into place. Grout around the tile, wiping away excess before it dries, and seal the new grout. Metal & Glass: Glass and stainless steel or other countertop metals are virtually heatproof.